On the heels of last month’s anti-gun, anti-Trump March for Our Lives adult-funded and backed protest by teen survivors of the Florida school shooting that killed 17 people at a Florida high school, another left-wing event is planned for Saturday. The event is organized by the Town Hall Project website, started by former Hillary Clinton campaign staffer Jimmy Dahman last year. 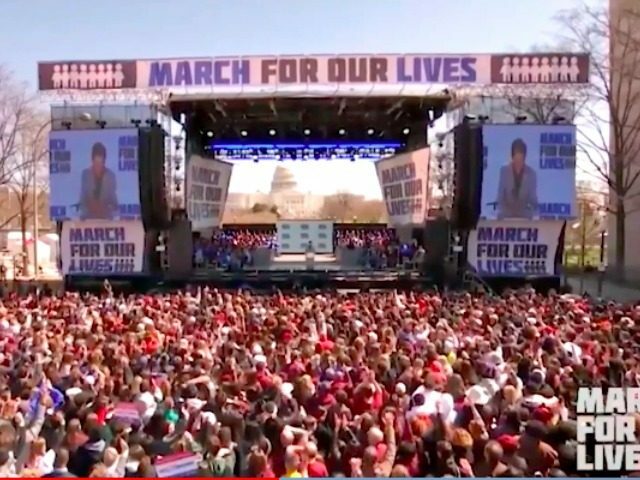 That entity is now connected with and promoting a “teen-led” series of meetings with members of Congress or candidates running against them over this week, culminating on Saturday with the Town Hall for Our Lives. The website is backed and funded by a coalition of leftists, including Tom Steyer’s NextGen America, the Center for American Progress (CAP), Indivisible, and former President Barack Obama’s Organizing for Action, among others. The Sun Sentinel reported that Florida Reps. Ted Deutch, Debbie Wasserman Schultz, and Frederica Wilson — all Democrats — will be attending a “series of gun control forums” this week in that state. On Twitter, Marjory Stoneman Douglas High School student David Hogg and others in the student-led #NeverAgain movement called on allies to organize the town halls, to be held during the current congressional recess that ends April 9. The idea, Hogg wrote, is for supporters to meet with lawmakers directly and push for gun reforms ahead of November’s midterm elections. “Call your rep today to organize it and if they refuse to show up, just invite their opponent,” Hogg tweeted on March 26. According to the Town Hall for Our Lives portion of the Town Hall Project website, 525 “town halls, empty chair town halls, and tele-town halls” are planned over the remainder of the Congressional recess, which ends on April 9. The School News Network, a public schools website, posted a story about one event on Saturday in Republican Rep. Justin Amash’s district in Michigan. Students invited U.S. Rep. Justin Amash, R-Cascade Township, but he is not planning to attend. Amash “will be observing Orthodox Holy Saturday (prior to Orthodox Easter on Sunday) with his family and faith community,” said Corie Whalen, his communications director. However, Fountain Street senior minister the Rev. Fred Wooden and Cathy Albro, Democratic challengers to Amash’s 3rd district congressional seat, have confirmed their attendance, organizers said. Led by students from City High School, and other Grand Rapids Public Schools, Forest Hills and East Grand Rapids, the event is in conjunction with other student-hosted town halls around the country at the urging of student activists from Parkland, Florida, where 17 students and staff were killed in the Feb. 14 shooting at Marjory Stoneman Douglas High School. “The purpose of the town hall is to find out what our representatives plan on doing about gun control and gun violence, and how they plan on keeping us safe,” Ellie Lancaster, a senior at City High said in the School News Network report. The Town Hall Project is using left-wing community organizing tactics, including providing signs, buttons, t-shirts, posters, and other “resources” that promote the talking points of groups like CAP and Indivisible. Hundreds of thousands of us marched across the country on March 24. But that’s only the beginning. To take this message directly to lawmakers, we need them to hear us directly–and soon. Every single member of Congress is back in their district on District Work Period–better known as “recess”–between March 23 and April 9. So March for Our Lives has raised the call for a congressional Town Hall in every district in America on April 7. This is only possible if Americans across the country rally to organize and mobilize for these events. The website advises activists on a wide range of issues, from choosing a venue to advertising and promotion on social and other media. It falls to each of us to be those anxious, jealous guardians of our democracy. Embrace the joyous task we have been given to continually try to improve this great nation of ours because, for all our outward differences, we in fact all share the same proud type, the most important office in democracy, citizen. The March for Our Lives logo is now featured on the Town Hall for Our Lives website.